Engineering firms are warned to take control of their own futures and establish vibrant apprenticeship and training partnerships, as they are faced with the chronic skills shortage. That is the view of Edward Grainger (pictured), a Director of Grainger & Worrall (GW). 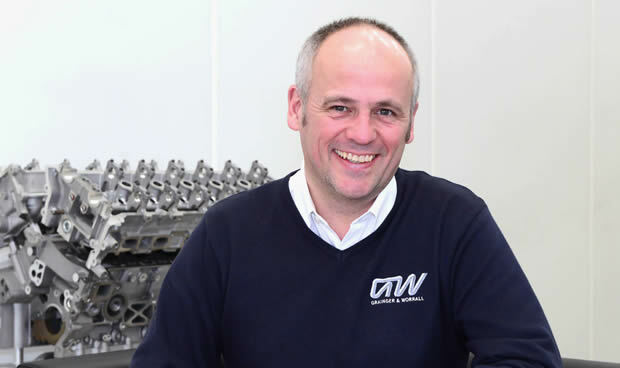 Operating in the highly competitive automotive component sector, Bridgnorth-based GW designs and manufacturers engine castings for the likes of Aston Martin, Bentley, McLaren and the majority of teams on the F1 grid. Despite the fact that the £50m turnover business has consistently increased its turnover by around 15% every year in recent times, attracting highly skilled engineers to maintain this growth has become a challenge. Frustrated by the lack of skilled engineers and casting/machining technicians with experience in CAD design, CNC setting, patternmaking and production cell operation, GW initially decided to establish its own training academy. Having shared this intention with other local companies, GW soon realised that joining forces with like-minded employers in the region would make much more sense. These businesses, all of whom had similar skills needs, includedClassic Motor Cars and Salop Design & Engineering. The trio of businesses partnered with In-Comm Training to form a consortium which last year secured a £1.9m contract from the Marches LEP, funded via its Growth Deal with Government, to develop the Marches Centre of Manufacturing and Technology. Now a community interest company, the consortium has privately invested £1.1m into the development of MCMT which aims to target 2020 learners by 2020. It aims to develop apprentices in advanced manufacturing and engineering, giving employers a strong pool of skills to tap into as they continue to compete globally. What’s an apprenticeship really like?